The use of long-term ecological datasets to explore the importance of the effects of environmental variability on higher predator populations has been focused mainly on high-latitude areas. We modeled the population dynamics of the Westland Petrel (Procellaria westlandica), which spends its time mostly in subtropical waters during both breeding and the interbreeding migration across the Pacific Ocean. 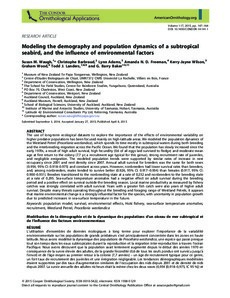 We found that the population has slowly increased since the early 1970s, a result of high adult survival, high fecundity (0.6 of all eggs laid survived to fledge) and moderate mean age at first return to the colony (7.7 yr; a recruitment age typical for this genus), strong recruitment rate of juveniles, and negligible emigration. The modeled population trends were supported by similar rates of increase in nest occupancy since 2001 and nest density since 2007. Annual adult survival for breeders was the same for both sexes (0.954, 95% CI: 0.918-0.975) and constant across years. However, nonbreeders had lower survival rates than breeders, and, among nonbreeders, males tended to survive better (0.926, 95% CI: 0.917-0.934) than females (0.917, 95% CI: 0.900-0.931). Breeders transitioned to the nonbreeding state at a rate of 0.232 and nonbreeders to the breeding state at a rate of 0.295. Sea-surface temperature anomalies had a negative effect on adult survival during the breeding period and a positive effect on survival outside the breeding season. Local marine productivity as measured by fishery catches was strongly correlated with adult survival: Years with a greater fish catch were also years of higher adult survival. Despite many threats operating throughout the breeding and foraging range of Westland Petrels, it appears that marine environmental change is a strongly influential factor for the species, with uncertainty in population growth due to predicted increases in sea-surface temperature in the future.